Most of the alpha particles passed through the gold foil with no or minor deflections. To their surprise, however, some of the alpha particles bounced backward. Rutherford said that it was “as if you fired a 15-inch shell at a piece of tissue paper and it came back and hit you”. Since the large and highly energetic alpha particles could only have been repelled by similarly positive and large particles, and since there were so few of these rebounds, Rutherford concluded that the alpha particles must have hit small but dense masses of positively charged particles. 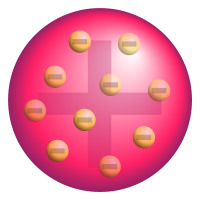 This led Rutherford to propose a new model of the atom, in which most of the mass of the positive charge is concentrated in the middle in the nucleus, and electrons fill a large volume of space – much larger than the nucleus itself – around the it. An atom consists of mostly space. It contains a highly dense mass – the nucleus – at the centre, and electrons filling a very large volume of empty space around it. 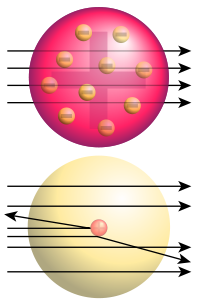 Thus, all images of atoms that you see in chemistry text books are falsely scaled so that the nucleus is much larger than it should be and the electrons are much smaller and closer to the nucleus than they should be – it’s the only way for them to be visible. To get an intuitive understanding of the true dimensions of the subatomic particles, let’s scale the atom to the size of a football stadium. In that case, the nucleus would have the size of a pea, but it would have a mass of 250 million tons! I have learned about and seen the gold foil experiment in numerous books, and it is a very well known experiment, so you will have no problem finding resources to learn more about it if you wish. Despite its place in mere high school and introductory chemistry courses, this is one of the most profound experiments in the history of physics and chemistry, and it’s a nice example of how experimentation is at the heart of the scientific method. In case you’re curious, I read “Chemistry” by Olmsted and Williams (3rd edition) to brush up on the details. If you want to replicate the calculations of the density of a nucleus, eHow has a nice example.